Do Jesus & The New Testament Support Racism And Rioting? Thugs on both sides are wrapping themselves in a veil of virtue, even invoking religious language to justify their ’cause’. And how do their claims stack up? On one side, people claiming to be Christian are rallying around their white skin and denouncing the evils of black people, Jewish people and anyone else they might think of despising. 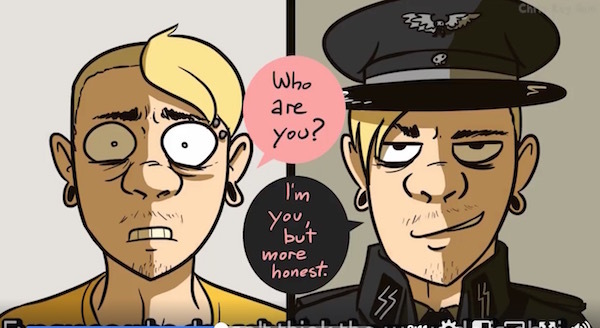 If you want a great parody of what the supposed anti-Nazis are doing, give this one a couple minutes of your time. The guy who made it put EXCELLENT production value into it. So basically, we’re looking at two groups who are seething with hate toward each other, thinking they are the white knight (so to speak) riding to the rescue of society against the cultural Boogey Man. And they are coming armed to the battle. What does the CHRISTIAN response look like? Not like that. We have SEEN the Christian response. There was a pastor who led a movement that changed our nation’s history. He stood up, once to tell us about A ‘Dream’ he had. Remember him? He was a Reverend. His goal was for us ALL to be EQUAL. Not to punish the other side for past sins. Why would he SAY such a thing? Because the Bible does, too. What about Jesus OWN words? He spoke about race. There was a group with real racial conflict with Jewish people of his day. They wouldn’t even associate with them. They would walk a LONG road around their territory so as not to ‘sully’ themselves through even being among them. And Jesus made him the HERO of his story about showing love for our neighbor when the moral pillars of his society both failed in showing basic Christian love. We mean, of course, the parable of the Good Samaritan. He similarly showed particular care and concern for the Woman At The Well (also Samaritan) making her one of the very few people to whom Jesus expressly admitted his true nature and purpose. When Jesus (did we mention he was Jewish?) was asked about the most important rule of all, what did he answer? But surely he doesn’t mean THOSE people? They’re such douchebags and assholes. And they’re MEAN to me. So, do we need to pick sides and say which one is the ‘bad guy’? It’s pretty clear they’re BOTH the bad guys. Next time they pretend to be on the side of virtue, you can set them straight. Share if you agree there are NO good guys when those two fight.